Pope Francis has announced a toughening up of the miracle approval process for potential saints, ruling that a near unanimous agreement of medical experts was needed and that they cannot be paid for their services in cash, reports The Tablet. The latest changes, announced by the Vatican on Saturday, state that five out of seven - or four out of six - medical experts must agree that a miraculous cure has taken place while a possible one cannot be assessed more than three times. Remuneration for the medical advisers, the rules added, should be made only by bank transfer, in an attempt to bring more transparency to the saint-making process which, according to some estimates, costs as much as $750,000. The banning of cash payments came on the same day the Holy See announced it had signed the United Nations convention against corruption designed to clamp down on bribery, embezzlement, and money laundering, in what is another sign of the Pope’s determination to clean up the Vatican. The process to declare someone a saint has been subject to controversy recently with leaked documents in the latest Vatileaks scandal revealing that millions of euros involved in canonisation causes had been left unaccounted for. 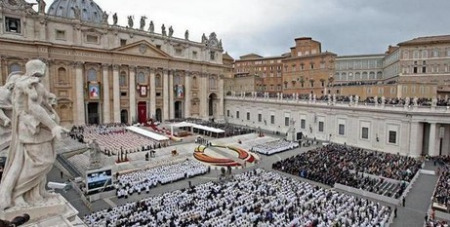 In his book based on leaked Holy See documents, Italian journalist Gianluigi Nuzzi revealed that a commission set up in 2013 by Pope Francis froze the accounts of almost everyone involved in the work of choosing saints, including one postulator who had more than $1.5 million spread out among three Vatican bank accounts. But on Saturday Paloma Ovejero, the Deputy Director of the Vatican Press Office, told journalists that medical experts will be paid a total of $5500 (about $750 each) for their work in assessing a potentially miraculous cure. Before the group meets, two experts will undertake preparatory work looking at a case and submit a report. And the president of the group examining the cures can only serve two five-year terms of office. Reformers have also raised questions about the need for two miracles to be approved by the Vatican in order to declare an individual a saint, with many feeling it unnecessary and theologically dubious.